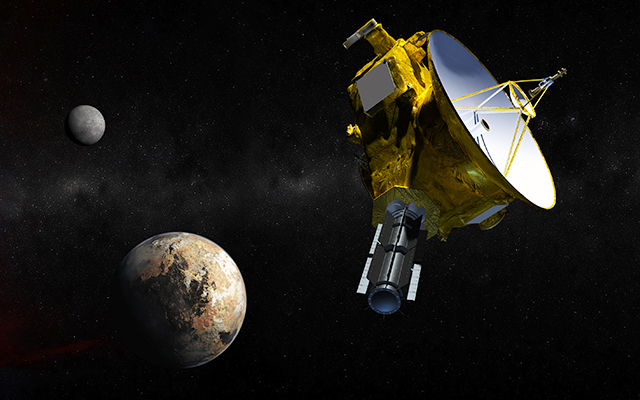 Artist’s rendering of the New Horizons spacecraft as it approaches Pluto. If all went according to plan, NASA’s New Horizons spacecraft swept past Pluto this morning just before 8 a.m. Eastern time, offering scientists and the public a glimpse at the previously unexplored edge of the solar universe. New Horizons launched in 2006 and has traveled 3 billion miles to get to within 7,800 miles of the icy dwarf planet. The spacecraft is expected to check in with mission control later today and send back photos and information about Pluto. 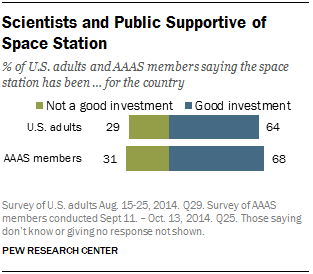 1 Americans are supportive of the space program and space exploration. In a 2011 Pew Research survey, 58% of Americans said it is essential that the U.S. be a world leader in space exploration. Some 38% said they think the space program contributes “a lot” to scientific advancements that Americans can use, and another 36% said the program contributes “some” to such advancements. Most also said that the space program contributes a lot (34%) or some (34%) to America’s national pride and patriotism. More broadly, in a 2009 Pew Research survey, 74% said that space exploration does more good than harm, while only 17% said it does more harm than good. Americans were also supportive of specific aspects of the U.S. space program, such as the space shuttle program and the International Space Station. About two-thirds (64%) of the public said the space station has been a good investment for the country, while 29% said it was not a good investment, according to our 2014 survey. And the 2011 poll found that 55% of Americans said that the space shuttle program had been a good investment for the country, compared with 36% who said it was not a good investment. 2 Americans and scientists agree on the value of space exploration, but disagree on the importance of human astronauts. As was the case with the general public, a solid majority (68%) of members of the American Association for the Advancement of Science (AAAS) surveyed by Pew Research said the space station was a good investment. But differences emerged on the question of whether human astronauts are essential to the future of the U.S. space program. A majority of Americans (59%) considered the use of human astronauts in the future to be essential, while 39% viewed astronauts as not essential. 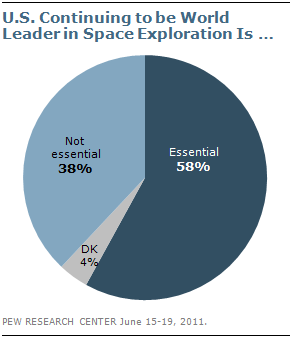 AAAS members were closely divided, with 47% saying that human astronauts are essential and 52% saying they are not. 3 Americans have a favorable opinion of NASA. In a January 2015 survey, 68% of Americans expressed a favorable view of NASA, similar to that of the Centers for Disease Control and Prevention among the eight federal agencies we asked about. (Seven-in-ten had a favorable view of the CDC.) This was in line with similar favorable ratings for NASA in the past. 4Americans are optimistic about the future of space exploration. A 2010 survey conducted by Pew Research and Smithsonian magazine found that 63% of Americans expected astronauts to land on Mars, and 53% believed that ordinary people would be able to travel in space by 2050. 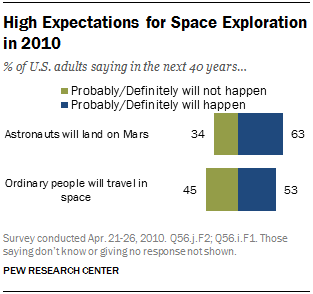 Some Americans are even more hopeful about the possibilities of space exploration. One-third of Americans predicted in a 2014 Pew Research/Smithsonian survey that humans will have long-term space colonies in the next 50 years. 5 Although they value the program and are proud of its achievements, Americans are reluctant to pay more for space exploration. Just 23% of Americans said the U.S. spends too little on space exploration, according the National Opinion Research Center’s General Social Survey (GSS) conducted last year. About four-in-ten (42%) said the U.S. spends about the right amount, and 25% said the U.S. spends too much on space exploration. Americans were more likely to say the government is spending too little on areas such as education (70%) and health (57%).